The smallmouth bass in Algoma are big, aggressive and abundant. I caught my first smallmouth bass on a four weight rod. At the time it seemed like I had hooked into a record brookie, but when I finally netted the fish, which turned out to be a two pound smallmouth, I realized bass fly fishing was maybe something I should look into more. Today I am fully addicted to smallmouth bass and proud of it. Whether catching them with topwater offerings or on a streamer, black bass are exceptional fighters for their size..
Over the years I have enjoyed the good fortune of casting a fly to smallmouth throughout North America. But there is one place I really love for smallmouth – Northern Ontario and specifically Algoma Country! The smallmouth bass here are big, aggressive and abundant. You can catch them in rivers, lakes, ponds, virtually anywhere. 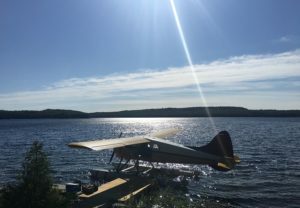 You can choose fly-in lodges to catch them at, drive-to lodges or even stay at motels or resorts and bring your own boat. There are lots of options to match everyone’s budget. I must admit that I enjoy targeting really big bass and here in Algoma, my chances of catching a record fish are high. This is a place where average fish are 17” to 19” with 3-4lb fish being common. I have personally caught numerous six pound specimens and one that hit seven pounds. Sadly I lost one at the side of the boat, which I estimate, weighed eight pounds or more. 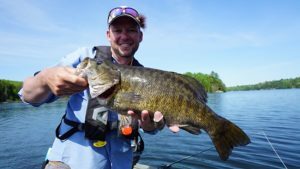 There are several reasons why the smallmouth reach such epic sizes. First, the bass here receive little fishing pressure and few have ever seen a fly. Few people harvest bass, most anglers are focused on the walleye. The second reason is the forage available to the bass. There is abundant crayfish, minnows, sculpin and frogs. But the real reason the smallmouth reach monstrous sizes here have to do with smelt. Throughout Algoma most of the lakes have large populations of smelt that provide a great deal of protein and fats for the bass. 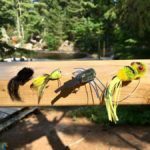 In this article I’ll detail information on places to go, flies to use and presentation techniques that will help you catch lots of big bass in Algoma! 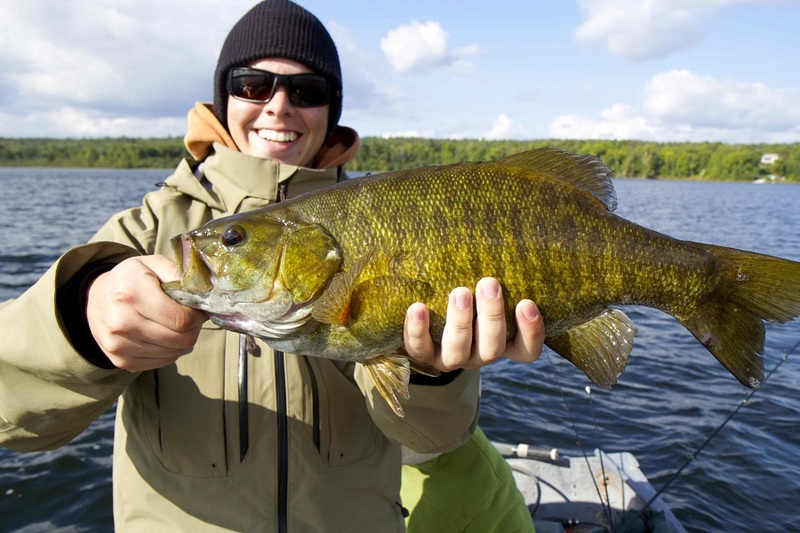 It’s important to note that the season for smallmouth varies throughout Algoma. Much of Ontario has a standard season start of the third Saturday of June. However, recently the MNR has made changes to these rules in much of Northern Ontario and in some places there is no closed season. Since Algoma is approximately 25,000 square miles in size, it is important to check on the regulations to ensure you know what the season is for bass. Your lodge, outfitter or local license office will be able to help you get the right information. If you do angle for bass in the areas that have no closed season, then here are a few things to consider. I enjoy fishing for pre-spawn bass but once they go on their nests, usually in early June, then I stay away from the shallows. The males are on the nests protecting the young from predators such as perch and sunfish. You can still fish for bass but instead target the post-spawn females which are usually nearby, usually adjacent to deep water on drop-offs, shoals or ledges. For the rest of the season, often right into October, you can fly fish for smallmouth without concerns. If you love topwater action, Algoma is truly nirvana! 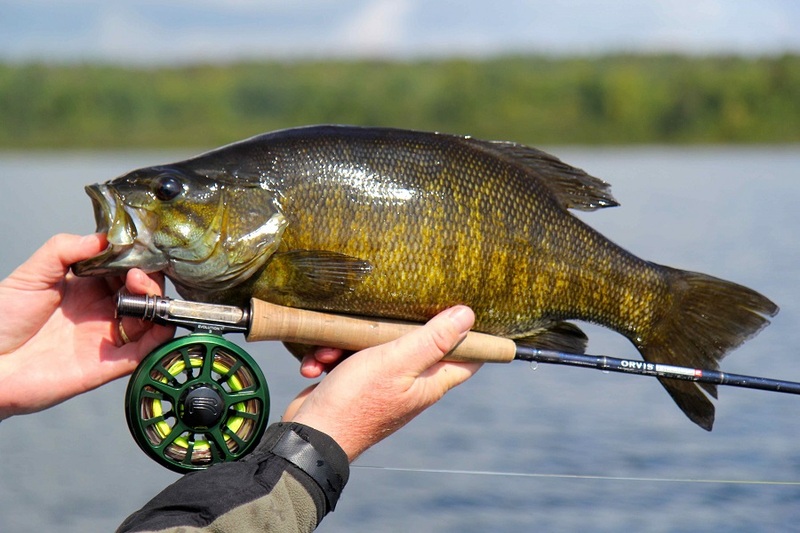 Throughout most of the season the smallmouth will readily come to a topwater offering like a popper. The only period when topwater flies don’t work well is at the start of the season, right after ice-out (usually early May). But for the remainder of the season, topwater action is often red-hot. During prolific hatches of Hexagenia, smallies will feed in a frenzy and any Hex fly will work well. Even large stimulators in orange seem to trigger takes. For poppers my favourite colours in order of choice are: yellow, orange, black and green. For some reason, probably due to the tannic stain in many waters, yellow and orange work exceptionally well. I find smaller poppers in sizes 2 to 6 work best. Deerhair poppers in shades of brown also work well and I believe they are often taken by bass who think this is a mouse. In July and early August the smallmouth are scouting the shallows, looking for small juvenile leopard frogs that have made the mistake of swimming out too far. I like concave or flat noses on my flies, this helps to move water and causing “popping” which draws curious smallmouth in to investigate. 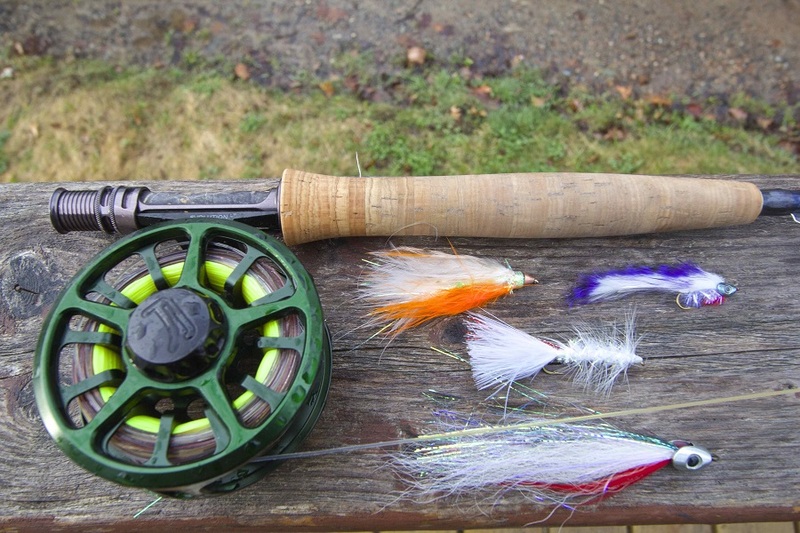 For equipment, I find a five or six weight rod coupled to a floating fly line is perfect for most applications. Bass designed tapers with their short heads work exceptionally well at turning over flies in windy conditions, I highly recommend them. For leaders I like knotless nine foot lengths with either 10lb of 12 lb tippets. Key to using poppers is your retrieve. You must vary it to match the mood of the fish based on current conditions. Like most fly fishers, you can use crayfish patterns and woolly buggers of differing sizes and colors to catch bass. They both work equally well. However, if you want to catch some truly epic smallmouth, then using streamer patterns is the way to go in Algoma. Muddlers, deceivers and strip leeches will all work but my favourite streamers to use up here are smelt patterns. 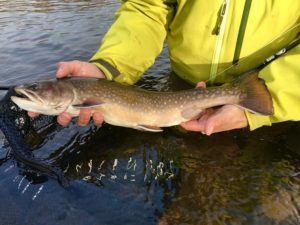 In fact, smelt patterns are considered the best fly to use when searching for big brook trout as well. Smelt are abundant throughout Algoma and since they provide year-round forage, they are a key means of existence for smallmouth. Most smelt are in the 4” to 6” size here with colour variations on their backs from brown to dark green. White/silver sides seem to be key to any pattern that is successful. 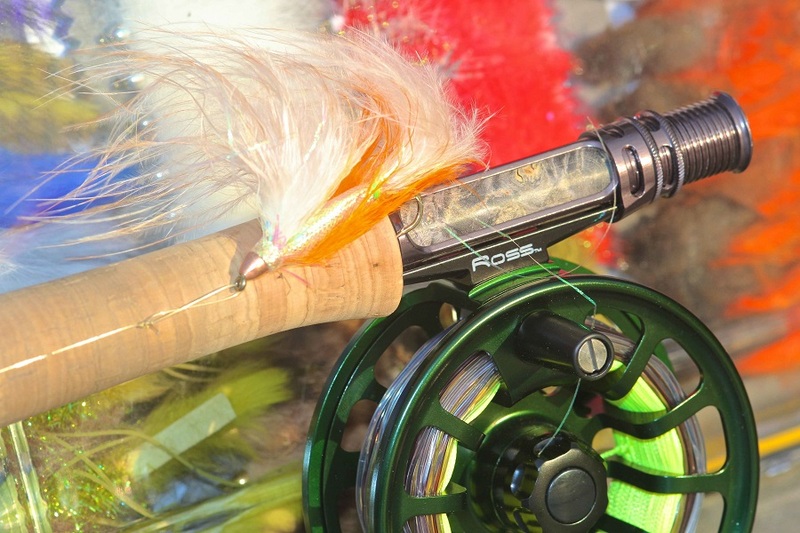 Fly designers who either live in Algoma or frequently visit have come up with some exceptional patterns that work well. Scott Currie from Massey has created a great pattern that seems to work for a number of species called “Scotty’s McFly”. You can buy them thru his flyshop (www.flymart.ca) or you can tie them yourself. The Gamechanger designed by Blane Chocklett from Virginia is a popular new fly that works equally well for lake trout and other species. It is a fully jointed fly that has great action when retrieved. 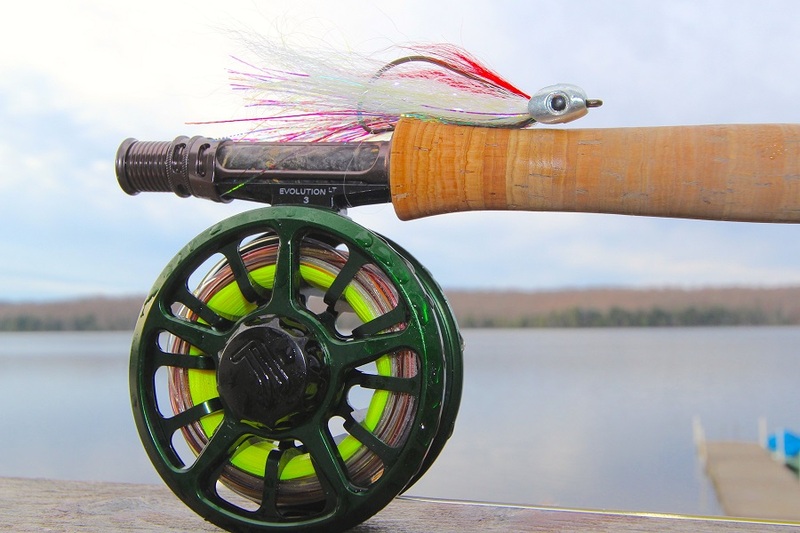 For getting your fly down deep near the bottom, it is hard to beat Frank’s Smelt designed by a frequent visitor to Algoma – Frank Roggernbuck of Michigan. Frank has come to Algoma for over 20 years, just because of the massive sized smallmouth bass that inhabit the region. We have included Frank’s recipe for this deadly fly. When using any of these patterns, I strongly recommend you use a fast-action six or better still – a seven weight rod. You will be hooking into some big bass with these patterns and you want to be able to properly fight them in with a stout rod. These rods should be matched to a good quality intermediate fly line that will sink at a rate of 1.5 to 2” per second. By counting down your fly using this flyline, you will ensure that it is in the kill-zone for smallmouth bass. First of all, look at the smelt in the waters you fish. Every water source is different and the size and coloration will be different, as well. With that said, my waters call for 5 – 6″ long with a green to brown back. Hook: anything you want, but a straight eye and a large ring, so it moves on the wire form well. Wire Form: Twin Spin wire form “C”, 2.1″ long, from Barlow’s Tackle, Richardson, TX. Thread: Ultra Thread, 140, red. Head: Fish Skull baitfish head, large, silver. You will have to use a pliers to squeeze the size of the line tie on the wire form down to fit the head over it. Follow their directions to put the head on once everything else is done. Wing: on top, copper, brown or green holographic flashabou; middle is pearl crystal mirror flash or pearl krinkle mirror flash; bottom is UV enhanced fiber. You can use some red craft fur for a throat, if desired. 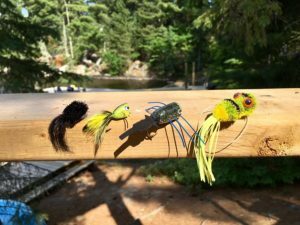 Articulated: you can tie on the hook with the same materials as the form, if you want to make an articulated fly – still keep it at the 5 – 6″ total length. Easy fly, works great – modify to fit your needs. The following locations are all highly recommended by the staff of The New Fly Fisher. We have gone to them all and can attest to the quality of their smallmouth bass fishery – they are second to none! For a fantastic do-it-yourself fly-in fishing trip, it is hard to beat what Lauzon Air offers. One of their best fly-in destinations is Hastie Lake that possesses huge smallmouth bass plus some largemouth bass as well! 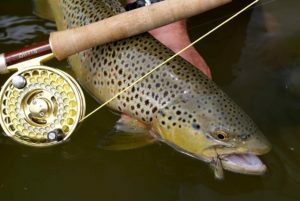 Great top water angling in June and July. Located in beautiful Algoma country in Northern Ontario, this comfortable lodge features some fantastic fly fishing for Smallmouth Bass. You can catch them on popper, streamers all through the day. Best of all you can either fly-in or take the train! Beautiful wilderness getaway, awesome fishing, quality boats, comfortable cabins, delicious food, friendly faces – Brennan Harbour Resort’s is a great choice for those wanting to hunt big Lake Huron smallmouth. For those wanting a great cottage and access to superlative smallmouth bass fishing, Birch Lake Resort is hard to beat. This drive-to facility offers comfortable cabins at very affordable prices plus access to over a dozen lakes that hold huge bass. Give them a call. 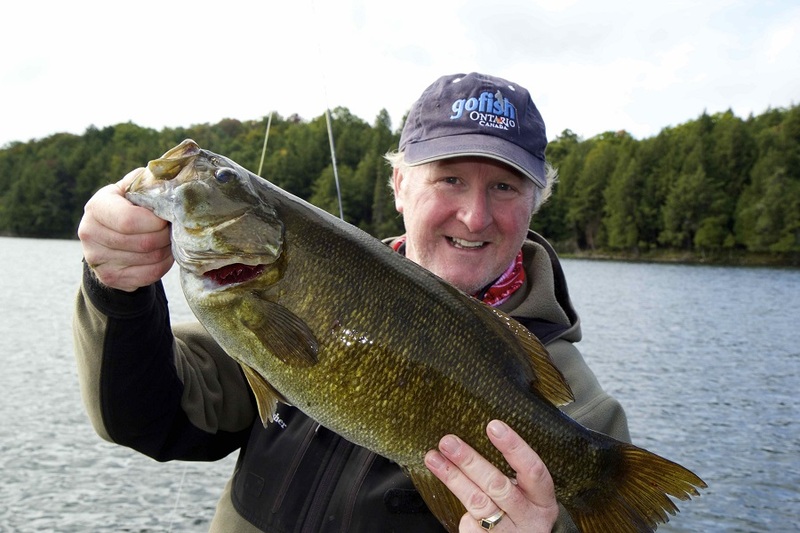 Elliot Lake and area has some great Smallmouth Bass fishing available on public waters. 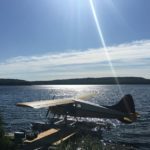 Reasonably priced accommodations, wonderful restaurant – all located in the wilderness of Northern Ontario. Best of all, you can drive to this region to sample the fishing for Smallmouth Bass and Northern Pike. Scott and his staff at flymart.ca are exceptionally experienced in fly fishing for smallmouth bass and other species in their region of Algoma. His drive-to fly shop has everything you need plus they can help provide you with guiding service to some top producing bass waters. Offering guiding, fly fishing supplies, accommodations and much, much more! 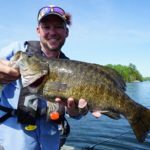 Adee and his staff will help ensure you connect with some great smallmouth action on both rivers and lakes in their region!